The front steps of our office are really starting to show their age. The interns had promised they were going to scrape and paint them last year, but managed to wiggle out of it by doing “work” instead. We can appreciate their reluctance because painting is preceded by priming and priming can’t occur without scraping. Scraping is a hands-on task. It is manual, time consuming, and messy. If we have any chance of “enticing” the interns into helping out, we thought we had better come up with an easier way to accomplish the tasks. In order to do that, we need some motorized options. After a bit of research, we have determined that the easiest way to get the front porch prepped for painting is with the aid of a multi-tool. What is a multi-tool? It is a handheld power tool capable of cutting, sanding, and scraping. It operates by vibrating like a pad sander instead of spinning like a circular saw. 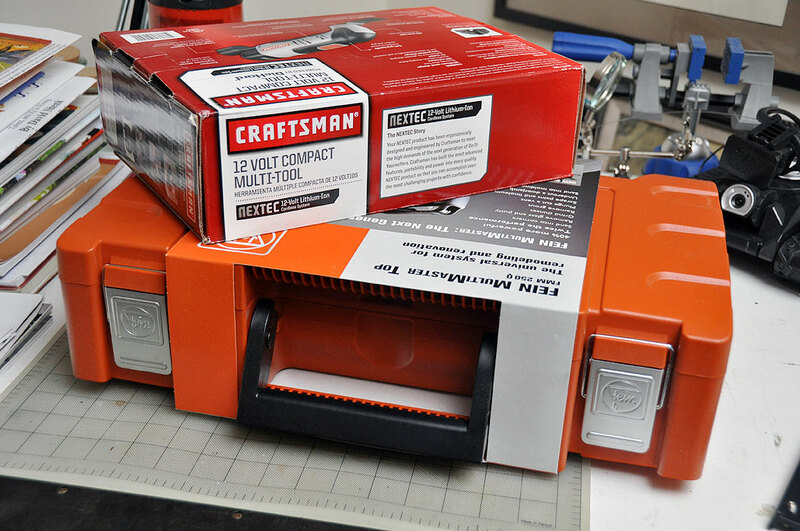 The two we will be testing are the Craftsman 12V Compact Multi-tool and the Fein MultiMaster. Most in the USA are familiar with the Craftsman brand. Fein is a premium brand in Germany and they are starting to get some traction here in the States. Some people even know that that the first electrical power tool was an invention of the C. & E. Fein Company. Wilhelm Emil Fein founded the company in 1867. His son Emil Fein developed the first electric handheld drilling machine in 1895. The Fein MultiMaster is a heavy-duty unit built for professional contractors. It is corded for continuous power and sized for maneuverability. Sanding and scraping is a power-intensive task. Fein made the decision to go with a corded design to maximize the power without adding bulk to the tool. Craftsman made a different choice in the design of their multi-tool. They created a compact yet cordless unit powered by a 12v lithium battery pack with a 30 minute quick charge capability. It is designed for cutting, scraping, sanding, grinding, removing grout, etc…basically all those annoying but extremely important prep tasks involved in any DIY project. 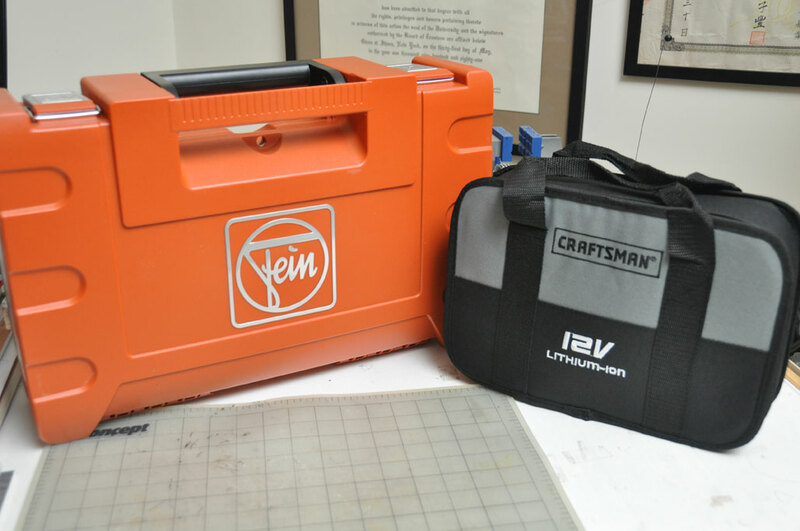 Both the Fein and Craftsman kits come with their own carrying case. 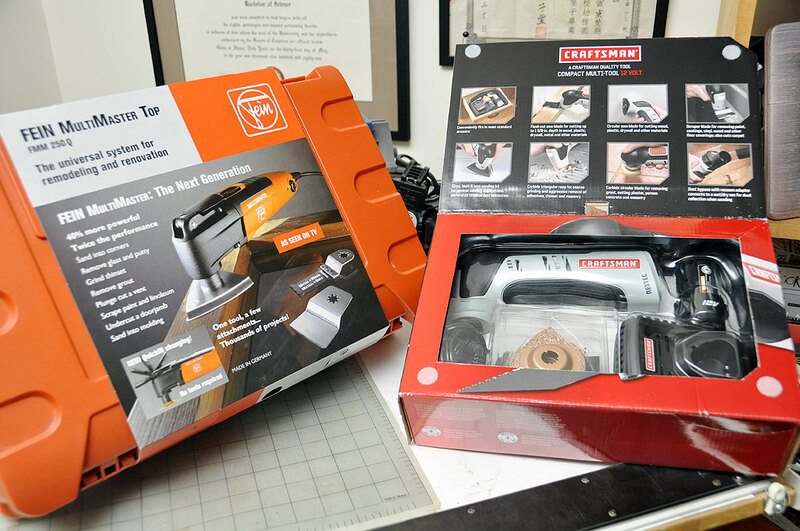 The Fein case is a sturdy molded unit with separate internal boxes. The compact Craftsman case is made of durable cordura and has a zip-in lid. Both cases have room for the tool, accessories, and the various bits.